Among the most serious educational challenges facing the United States is the large discrepancy in mathematical achievement between children from different economic backgrounds. For example, in 2015, 42% of U.S. 8th graders from low-income backgrounds performed below the basic level on the National Assessment of Educational Progress in Mathematics, compared to 16% of students from mid- and high-income backgrounds. The gap in mathematical proficiency between children from different socioeconomic (SES) backgrounds is present before children enter elementary school, and it progressively widens over the course of schooling. Importantly, these early differences have long-term consequences: Early mathematical knowledge predicts the rate of growth in mathematics learning and achievement as late as high school. Thus, ensuring that children from low-income backgrounds acquire basic numerical knowledge prior to the start of formal schooling is critically important for reducing the achievement gap, which is the main purpose of the current project. Specifically, the project will test the benefits of training activities for improving the mathematical achievement of kindergartners from low-income backgrounds using newly-developed tablet computer games. 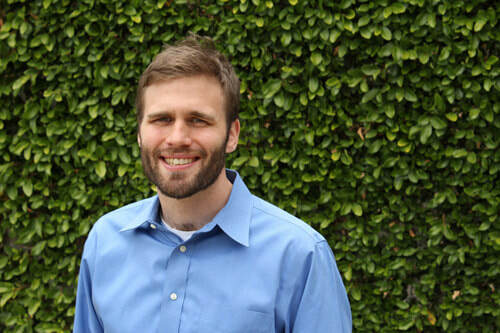 Assistant Professor Drew Bailey has been awarded the 2016 UC Irvine Excellence in Teaching Award for the School of Education during the 23rd Annual Celebration of Teaching, held May 5th at the UCI Student Center. During the presentation ceremonies, Dr. Bailey was honored for his commitment to student learning and development. This course is challenging for sure. I was extremely intimidated, but I see the value of the course and I think it was good to have it right the first quarter to prepare us for a good foundation. I might not appreciate it now, but I know this class right off the first quarter gave me an expectation of what kind of work I need to put in this program and launch a career as a researcher. Dr. Bailey respects his students and creates a safe learning environment characterized by mutuality, discovery, and collaboration. In addition to his excellence in undergraduate instruction, he is remarkable in his service to the undergraduate major [Bachelor of Arts in Education Sciences]. He serves on the UG major steering committee and the scholarship committee. His contributions are prescient and greatly valued by his colleagues. Dr. Bailey received his Ph.D. in Developmental Psychology from the University of Missouri. As an IES Postdoctoral Fellow at Carnegie Mellon, he worked closely with Dr. Robert Siegler. Dr. Bailey’s current research focuses on math development, individual differences, and longitudinal methods. 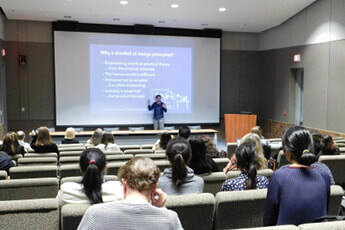 On May 6, faculty and student researchers gathered at Calit2 on the UC Irvine campus to hold a symposium titled "Fostering Literacy and Learning with Text and Data Mining". Guest speakers including Drs. Carol Connor, Scott Klemmer, and Danielle S. McNamara discussed text and data mining for an individualized learning environment, crowdsourcing, peer assessment, and an intelligent tutoring system (Writing-Pal) in various learning environments. This yearly event is sponsored by the UCI Data Science Initiative, UC Irvine School of Education, and UC Irvine School of Information & Computer Science. How Does Number of Deadlines and Course Format Affect Time Online? This study examines student study habits in an online pre-calculus course at a large public university in California. In particular, it looks at student login patterns and time spent studying to identify study habits associated with better academic outcomes, as measured by final exam scores and course grades. It compares how study habits change with more deadlines, as well as how study habits differ in the summer with fewer weeks. The study uses k-means clustering to identify students with similar study habits. It aims to find the same clusters using only early course data to identify students at risk of failing. The implications of this study will suggest ways instructors can better support students learning through individualized adaptive-responsive systems, particularly those struggling to meet course goals. The findings of this study can guide students’ learning in online courses, help instructors’ decisions on ways to provide support, and improve STEM retention when taken into consideration in course design. Government officials around the world are giving blended learning a key role in their short- and long-term educational strategy. The proportion of academic leaders who report that technology-enhanced learning is critical to their institution’s long term strategy has grown from 48.8% in 2002 to 70.8% in 2015. Despite the strategic role blended learning has at all levels of education, schools are facing challenges in carrying out a large-scale implementation of technology-enhanced programs (e.g. LAUSD's iPad program, Turkey's national FATIH tablet project). It is hypothesized that 21st-century technology-enhanced learning cannot fully flower when embedded in a rigid, 19th-century, Industrial-Age school culture. To maximize the impact of new technologies, decision makers and practitioners must shift away from an Industrial-Age to an Information-Age paradigm which fosters Any Time, Any Place, Any Path, Any Pace learning. Using Chile's largest institution of higher education as a case study, the effects of Information-Age learning environments on learning processes and outcomes will be explored. Latent Class Analysis (LCA) method as a clustering approach of educational data mining was employed to extract common activity features of 8,769 undergrad students taking blended courses spanning from 2012 to 2016. Three distinct classes emerged: High Achievers, Gifted/Misplaced and Dropouts. Implications for course designers, instructors and machine learning specialists are discussed. Learning Assistants provide one-on-one support for students enrolled in specific classes in the university. This study investigates the effects of having Learning Assistants as a facet of instruction on the level of textual cohesion in the writing of Academic English learners in college introductory writing classes. To analyze students’ writing cohesion, we employed Coh-Metrix (a computational linguistic data mining tool). We mainly focused on the Text Easability components, including narrativity, syntactic simplicity, word concreteness, deep cohesion, referential cohesion, verb cohesion, connectivity, and temporality. The sample includes 74 final essays from students in four writing sections, two with Learning Assistants and two without. Preliminary results suggest that students exposed to Learning Assistants display a higher level of textual cohesion in their writings. They also tended to write more paragraphs with fewer sentences in each paragraph, when compared to students who in non-Learning Assistants courses. However, preliminary results indicate that both groups have similarly low levels of word concreteness, suggesting that exposure to Learning Assistants does not improve students’ concrete vocabulary. Future analyses will compare students’ grade in course with Text Easability components and exposure to Learning Assistants. This study aims to examine the overall effect of corpora use on second language (L2) vocabulary learning. Corpora, which are structured collections of language data, have been widely used by language teachers, both to provide their students with authentic sample sentences and to allow students opportunities to autonomously explore structured text. Empirical findings have not been consistent, and no recent meta-analyses across the broad range of corpora studies have attempted to reconcile these inconsistent findings. We thus conducted a meta-analysis to systematically and comprehensively synthesize findings of empirical research on the impact of corpora use on L2 vocabulary learning. A total of 20 primary studies conducted up to date were identified from searches of databases, journals, and references, meeting our criteria for inclusion (e.g., with control groups). Among 97 effect sizes drawn from these studies, we found an overall positive effect of corpora on L2 vocabulary learning when weighted for differential precision (Hedges’ g = .949; SE = .150; p < .001). We also found variation in mean effect sizes across different teaching and learning contexts. Finally, we discuss the implications of these findings for guiding teachers on how they may want to use corpora in accordance with different pedagogical purposes. Previous studies about engagement in MOOCs focused primarily on behavioral engagement while paying little attention to cognitive engagement, which may lead to incomplete or even incorrect understanding about student engagement. Accordingly, this study measured both behavioral engagement and cognitive engagement involved in lecture watching to see: 1) how cognitive engagement is different from behavioral engagement at the individual level, and 2) whether cognitive engagement adds information that is helpful in predicting academic achievement. We found some students had relatively high behavioral engagement while decreasing in or maintaining low cognitive engagement, indicating that behavioral and cognitive engagement in MOOCs may have different patterns at the individual level. In addition, cognitive engagement is positively associated with achievement and can provide information that would improve the prediction of achievement. Vocabulary knowledge is essential in fundamental language skills such as reading, and the characteristics of vocabulary words may also contribute significantly to learners’ understanding and acquisition of words. Yet, the role and types of word characteristics are often underexplored. In this project, we introduce and highlight two word characteristics: polysemy—the number of meaning senses of a word—and semantic precision—how precise a word is, i.e., the number of hypernyms a word has. We created a program to generate the polysemy and semantic precision values of over 60,000 words using information from the WordNet lexical database (Miller, 1995). We demonstrate that the most common meaning senses of polysemous words tend to be less precise. We also show that these two new word characteristics are well correlated with existing lexical characteristics such as frequency and dispersion; polysemy is significantly and positively correlated with frequency and dispersion (the more meanings a word has, the more frequently the word appears in general and in different texts), while semantic precision is negatively correlated with frequency and dispersion (the more precise a term is, the less frequently the word appears). Multiple regression and hierarchical regression analyses illustrate that, controlling for existing lexical characteristics, polysemy and semantic precision significantly predict people’s response time to lexical decision tasks; they also explain more unique variance than such existing lexical feature as dispersion. Overall, polysemy and semantic precision may prove to be useful constructs in future vocabulary and reading research. One’s ability to not only perform, but also learn and improve at working memory intensive tasks is critically important for the success in school, work, as well as to perform well in many complex cognitive activities across the lifespan. Working memory training has been the subject of much research and has shown to lead to improvements in important cognitive tasks in both healthy and clinical populations. However, one’s performance on an adaptive and challenging longitudinal working memory intervention may also serve as a useful assay of neural plasticity that might better inform our understanding of what factors facilitate or limit how individuals learn and improve at working memory-heavy tasks. With well-over 400 participants having completed at least 15 sessions of working memory training in our own lab, we have a rich dataset that allows us to investigate two key questions. First, we explore how individual factors, ranging from age to baseline ability to training context, i.e., home or lab setting, may influence the outcome of training. Second, we will determine whether one’s pattern of performance on the training task itself influences transfer gains on untrained tasks. Statistical analyses will be conducted with R and will include non-linear mixed modeling, machine learning, and data mining techniques. Preliminary results suggest that certain factors -- such as age, country where the study was conducted, training context, and baseline abilities -- significantly impact one’s ability to improve at WM training. Furthermore, factors such as gender, and n-back condition have no significant effect. In the research project, “Improvement Suggestions Generator with Reviews Data”, we explore how to set up a pipeline to exploit the reviews data to help human make decisions. The pipeline will have a wide range of applications in academy and industry where comments exist, such as teaching evaluations and products reviews. The pipeline includes cleaning and filtering the data, generating the key features, identifying these features’ polarity orientation, classifying the features into similar categories, and making automatic suggestions based on the previous discovery and rating formula. The technical keywords related to this project are data filtering, feature generation, sentiment analysis, and text mining. The main tools utilized include Part-of-Speech (POS) Tagging and the NLTK library. In this project, we use the reviews data provided by Yelp as the subject of interest. We choose the restaurants and filter 24974 businesses with reviews. We find out how the threshold value will affect the results of generated features and discuss possible solutions to improve the rating formula for each generated feature. Children with dyslexia account for approximately 17% of American youth. Reading comprehension involves considerable working memory (WM), and WM deficits are among the major underlying factors driving reading difficulties in dyslexia. A promising approach is to improve WM for dyslexic students. Research has indicated that WM is malleable, and studies of WM training (WMT) have improved both WM and reading ability in non-dyslexic (ND) children. Our study is a pre/posttest randomized controlled trial with 4th and 5th grade dyslexic and ND students, randomly assigned to the WMT or control condition. Children train on three computerized WMT games or on control games for 10 sessions lasting 15 minutes each and take pre- and posttests of WM and reading ability. We are collecting data at four elementary schools in California. Data collection at the first school is complete, and preliminary results indicate near transfer to WM measures and far transfer to reading measures. We are also interested in looking at whether amount of improvement in working memory helps predict transfer. VOSS: Micro-Ananlytics of Collaboration in Distributed Work: What Makes Collaboration Work? Collaborative writing has become increasingly common now. I revisit this research topic because both the tools and people’s skills have changed. In my dissertation project, I use both qualitative and quantitative research methods to investigate how people write together now. I have also built information visualization systems to complement existing research methods. By understanding what practices and tools people use in collaborative writing, I propose design implications for system designers to improve the tools, as well as collaboration guidelines for people to write together better. The continued advances in technology and web-based learning allow for more efficient personalized learning and assessment tools for students (Woolf, 2009). One of the fundamental affordances of technology is its ability to log students’ usage data, which allows for analysis of individual students’ interactions with such tools and consequently the development of more effective ones. The purpose of this study is to examine the extent to which students’ word knowledge and reading strategies can be improved after participating in the Word Knowledge e-Book (WKe-Book) intervention. By harnessing the affordances of technology, the WKe-Book aims to increase comprehension monitoring while building students’ word knowledge learning, which is an essential aspect of comprehension (Perfetti & Stafura, 2014). WKe-Book is an interactive e-Book which contains embedded questions and provides feedback, while it records user logs to further understand the students’ interaction with text. In this study, we examined 3-5th graders’ (n=347) vocabulary knowledge, comprehension and their interactions with the Wke-Book through analyzing the user logs. Classrooms were randomly assigned to immediate or delayed treatment groups, while within classrooms, students were randomly assigned to participate in weekly book club sessions, where they were provided guidance in smaller groups, compared to only reading the e-Book. Analysis of user-logs demonstrated that students who spent more time reading each page at the beginning and then sped up showed greater gains in their word knowledge, particularly for children in the book club condition. Word learning and comprehension monitoring gains were also greater for students who read the WKe-Book. 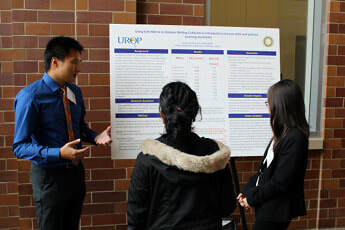 Six School of Education faculty members - Jacquelynne Eccles, George Farkas, Joshua Lawrence, Rossella Santagata, Mark Warschauer, and Di Xu - have mentored a total of 18 undergraduates for 11 research projects presented at the 2016 Undergraduate Research Symposium on May 14. The faculty members have been assisted by Ph.D. in Education students Peter McPartlan, Lynn Reimer, and Karen Taylor, and project manager Amanda Nili. 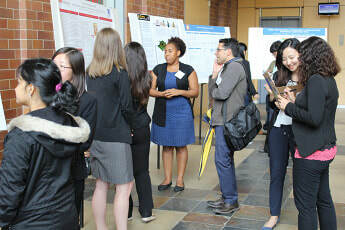 ​The UROP Symposium is an annual event that allows UCI undergraduates the opportunity to present, in a professional setting, the results of their research or creative activities, either as a poster or an oral presentation. English became the worldwide language of commerce in the 1800s because England won the Battle of Trafalgar against Spain and France for control of shipping lanes for commerce. In order to further investigate the multiple variables that contribute to one’s desire to learn English as a second language in places that have a primary language, the Southern European country of Italy was assessed. The objective of this project is to better understand the motivation behind learning English as a second language and to challenge the conventional socio-educational model of second language acquisition. This short-term study was conducted in the ethnographic tradition where the teacher—the syllabus designer—is the researcher. Two students, aged 12 and 15, were involved in this four-week program that began during a break in the academic year in Porto Recanati, Italy. The first part of the findings considers the motivation from the perspective of the child and his or her foreign language learning, whereas the second part looks into how the findings of the Porto Recanati study may contribute towards a better understanding of the effects of specific pedagogic procedures on motivation. This study further investigates how and why English is a mandatory course in most European elementary schools and its status as an international language. ​This study examines Asians and Latinos and their educational assimilation in order to better predict the success of these group within the United States. Past researchers claim that Latinos follow different assimilation patterns that include straight-line assimilation and segmented assimilation. Some researchers claim that immigrants follow straight-line assimilation by each successive generation completely partaking in the dominant culture. However, segmented assimilation theory suggests that some generations may acquire some facets of the dominant society but not all. By looking at standardized test scores and levels of educational attainment I examine Latinos’ patterns of educational assimilation. I used the Educational Longitudinal Study from 2002 to conduct a statistical analysis through multiple linear regressions. By studying students’ demographics, including race, gender, generational status, socioeconomic status, parent’s educational expectations, delinquent behavior and students’ educational expectations, I looked at its effects on test scores and educational attainment. AbstractAs certain groups—low income, ethnic minority, and/or first generation college students—continue to be underrepresented in STEM (science, technology, engineering, math) fields, interest in improving outcomes for these students has grown. In order to understand what pedagogy students experience when they begin course work in a STEM major, we conducted a mixed-methods study of both innovative and traditional course designs in lower-division biology at an R1 university. The present study observed ten course sections of introductory biology taught with three distinct methods (flipped, blended, and traditional) in fall of 2013 and 2014. Student interviews reveal compelling stories of underrepresented students pursuing degrees in STEM. In order to better understand why flipped formats were associated with student success, we present the experiences of underrepresented students (first-generation, ethnic minorities, and transfer students) in these settings. Furthermore, we found the flipped method of teaching was associated with a .13 standard deviation increase in course grade and the students were 20% more likely to take the next course in the sequence. Chem1A and Chem1B are the first two quarters of the general chemistry sequence at UC Irvine. These classes are taken by many science majors. However, out of those taking Chem1A and Chem1B, only certain majors are required to have concurrent enrollment in the corresponding laboratory courses, ChemM2LA and ChemM2LB. The objective of my research is to examine the impact of ChemM2LA/ChemM2LB on Chem1A/Chem1B students. Based on the literature I have found, repetitive exposure is a crucial part of learning science; lab courses may provide additional content exposure. To address this question, I will: (1) interview students to analyze their attitude and personal experiences regarding lab, (2) use the SPROUT protocol to observe different teaching strategies used in lab and then compare the absence and presence of those strategies to lecture for the same course, and (3) analyze student-level data from the department to see change of majors, current course grade, enrollment in subsequent course, and grade in subsequent course. After conducting the interviews, I found that students have a negative feeling towards their first two quarters of lab in terms of both course load and content. Students feel that material in the lab and lecture did not coincide. Observation of the lab and lab lecture reveals that teaching strategies believed to be helpful are present. Future analysis will include the student-level data, to determine how lab exposure affects student outcomes. Abstract The ability to analyze teaching has been recognized as a fundamental aspect of teacher expertise. Teachers who attend to the details of student mathematics thinking and who reason about ways teaching can be improved have been found to be particularly effective. Prior research provides evidence that video-enhanced learning experiences can improve teachers’ abilities to analyze teaching. The current project investigated the impact of a 20-week long, video-enhanced mathematics methods course on pre-service teachers’ knowledge for teaching mathematics and student-oriented beliefs about mathematics teaching and learning. Two groups of pre-service teachers were randomly assigned to either an experimental group—the Learning to Learn from Mathematics Teaching group (n=30) or a control group—the Math Methods Course group (n=30). At the end of teacher preparation, the experimental group outperformed the control group on a series of measures. Attention to student mathematics thinking became central to teachers’ video analyses and self-reflections. This poster presentation reports on a two-year follow up into the profession. Through surveys administered at the end of each year of teaching, the study examined whether teachers maintained a focus on student thinking over time and whether perceived school support was related to teachers’ focus. Findings suggest that a larger number of experimental-group teachers than control-group teachers focused on student thinking during their first two years into the profession. Perceived school support was not related to teachers’ focus. The study has implications for the design of effective teacher preparation. Traditional learning is the most common method used in higher education courses and is composed of large-enrollment lectures with midterm-based feedback to help students assess their learning. Unlike traditional learning, learning assistants programs create new environments that incorporate group work and discussion platforms, led by undergraduate students. Such programs have provided upper-level undergraduate students (i.e., learning assistants; LAs) with roles of authority and opportunities to organize lesson plans, to increase the chances of content knowledge among undergraduate students. Research by Otero, Pollock, & Finkelstein at the University of Colorado examined the impact of LAs on faculty teaching styles and the content knowledge gains of the LAs themselves. This research has been limited to STEM courses, and rarely examines the student perspective and the affects of LAs in other fields. The purpose of this study is to determine how UCI’s Learning Assistants Pilot (LAP) affects student outcome in social science and non-traditional STEM courses such as Physics 2, Political Science, and Economics by studying grade in course and examining the differential effects for underrepresented students. To understand student perspectives, eleven undergraduate students were interviewed about the quality of LA support for group work, discussion, and obstacles in learning. These interviews are studies via open-coding to determine how LA involvement in courses may or may not affect undergraduate student identities and sense of self efficacy. Preliminary findings suggest that group work and collaboration are effective methods of learning and should be the focus of future higher education research. Title: Are Transfer Students More at Risk of Experiencing Higher Test Anxiety than Native Junior Students? Test anxiety has been linked negatively to students’ well-being generally and it impacts students both psychologically and physiologically. Despite the abundant research and advice on test anxiety, few insights have been given to differentiate sub-groups such as students who transfer from two-year to four-year colleges. Since these students may encounter different academic requirement and challenges, some literature showed that transfers had to earn more credits than native students both before and after transferring. Given the large volume of transfer students each year, the current study aims to examine whether transfer students were more anxious about exams compared to native junior students who have been in the same university since freshman. The Test Anxiety Scale developed by Irwin G. Sarason was registered as the major instrument. 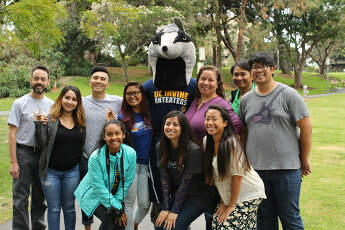 Participants were all current UCI junior students from a variety of majors, who were recruited through upper division classes, including 15 transfers who transferred from community colleges and 38 native students, and each of them completed the online survey individually. The results showed that native juniors scored significantly lower on test anxiety than their transfer peers. One possible explanation for the higher level of anxiety identified among transfer students is the potential difficulty in adjusting to the test system in different institutions, thus highlighting the importance of providing additional counseling or academic support to transfer students. Further inspection on specific questions indicates many students’ general acknowledgement that the university should recognize some students have more distressful experiences when facing tests than others. Research on post-transfer has found that transfer students tend to struggle more than non-transfer students. Additionally, majoring in a STEM (Science, Technology, Engineering, and Mathematics) field is considered a barrier to transfer success. The purpose of this study was to examine which factors have an impact on STEM transfer students’ success. Using observational data collected from Project SPROUT (Simple Protocol for Observing Undergraduate Teaching), linear regressions were conducted to determine if a relationship between classroom practices and student outcomes (i.e., grades earned in the class) existed. We also interviewed STEM transfer students to supplement the statistical data with first hand accounts in order to obtain a better overall understanding of why transfer students struggle. The study found that a majority of the transfer students interviewed had a decline in their overall GPA. These struggles can be attributed to a number of factors such as not feeling adequately prepared for the fast pace of a 10-week quarter system after being accustomed to a 16-week semester system, as reported by a majority of the students interviewed. An exploratory analysis was conducted to determine relationships between academic performance (GPA) and types of classroom practices including visual factors, assessments, involvement, consolidation, and multimedia practices. Linear regression analysis showed significant correlation between assessment and consolidation practices. The findings of this study have implications on what universities can do to help STEM transfer students be successful academically. Learning Assistants (LAs) provide one-on-one support for students enrolled in specific classes in the university. This study uses a mixed-method design to investigate the effects of having LAs as a facet of instruction on the level of students’ confidence and their writing ability. Pre and post surveys analyze students’ expectations for the course as well as their experiences with and without LAs. To analyze students’ writing cohesion, we employed Coh-Metrix, a computational linguistic data mining tool. Preliminary results suggest that students exposed to Learning Assistants display a higher level of textual cohesion in their writings. They also tended to write more paragraphs with fewer sentences in each paragraph, when compared to students enrolled in non-Learning Assistant courses. However, preliminary results indicate that both groups have similarly low levels of word concreteness, suggesting that exposure to Learning Assistants does not improve students’ concrete vocabulary. In addition, a focus group of eight Learning Assistants was conducted to explore what practices they use in their instruction of our population of interest and the outcomes. Results show that students received useful one-on-one academic assistance in the earlier phase of the writing process: brainstorming. Learning Assistants also worked in assisting the instructor, and saw themselves as both tutors and mentors, working on students’ content mastery and confidence. Our team has been working on Down with Food, a game designed to teach children ages 7 to 9 about the human digestive system. In the e-book layer the game’s main character, Zyme, takes users through a virtual tour of the various digestive organs. Each organ is associated with a mini-game to teach players about that organ’s role during digestion by using systems thinking—the ability to understand cause and effect. For example, the stomach game requires players to think about cause and effect as a system that can be nonlinear. Players must activate enzymes that digest food in the stomach by increasing the stomach’s acidity, but the increased acidity also damages the stomach’s inner lining, and so they must protect the stomach with a layer of mucous. To complete the mini-game players must understand that increasing acidity may have multiple effects on the body, and thus need to balance food digestion with the levels of acidity and the mucous barrier. SoE Alumna Dr. Feliza Ortiz-Licon has been honored at UCI's 46th Annual Lauds & Laurels Celebration as the 2016 School of Education Distinguished Alumna. Lauds & Laurels is the university's oldest awards ceremony, a tradition that has recognized more than 750 members of the UCI community for their service to the university, the community, or their profession. Dr. Ortiz-Licon is the senior director of K-16 education programs for National Council of La Raza (NCLR). Her background includes serving as director of policy for David Tokofsky, Los Angeles Unified School District Board of Education member, and as a teacher in the Long Beach Unified School District. Prior to serving in her current role as senior director of K-16 programs for La Raza, she was NCLR's regional director of education for California and the Far West. Dr. Ortiz-Licon earned her Ed.D. 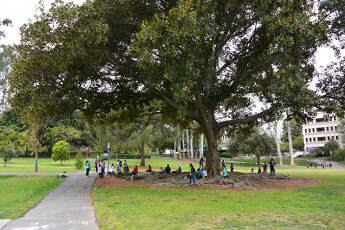 in Educational Administration, specialized in Urban Educational Leadership, from UCI in 2008. Dr. Ortiz-Licon has invested more than 20 years in the field of education, working in various capacities including teaching, research, school operations, educational policy, college access, and strategic planning. In her diverse work within the field of education, she has focused predominantly on access and equity issues, specifically as they relate to Latino students. In her current role as senior director of K-16 education programs for National Council of La Raza (NCLR), Dr. Ortiz-Licon collaborates with a national group of charter schools to improve the quality of instruction and curriculum delivered to Latino students while reinforcing the cultural and linguistic assets brought forth by this student population. To accomplish the greater goal of replicating practices and scaling reformative efforts, she has helped develop NCLR's school framework, which defines eight core qualities of high performing, Latino-serving schools. As a first generation college student, Dr. Ortiz-Licon understands the critical need to improve education in communities institutionally neglected in terms of resources and pedagogy. She shares with UCI the recognition that, for many low-income, first generation Latinos, education is the principal vehicle for upward social and financial mobility. Welcome to our 2016 Celebration of Doctoral Student Achievements. This has been a year of accomplishments and change. Our ranking moved up to # 25 in the U.S. and we will be welcoming a new Dean, Richard Arum, on June 30th. As doctoral students you have continued your impressive range of accomplishments and honors, including graduations, publications in major journals, presentations throughout the U.S., and representing the School of Education in the best possible light. At this event, we begin by recognizing the graduates who received their degree in the last calendar year, although they generally are not in attendance because they are dispersed in their new academic positions throughout the U.S. For 2015 an additional nine names are being added to the Ph.D. honor plaque, and copies of their dissertations have been ordered. Ten of you are receiving your degrees this June. Six more of you are planning to finish by December 2016. In April, 68 of you completed your Annual Report of Student Progress, which detailed your activities from Summer 2015 into Spring 2016. During this period, 18 of you published a total of 24 articles, demonstrating both scholarship accomplishment and your progression along the path to future membership in the Academy. Another 14 of you have 18 articles that are in press or accepted for publication, and 5 have a total of 12 articles that have received a revise and resubmit. Currently, 14 of you have 21 articles under review. Thirty-seven of you presented at a total of 75 conferences this past year. Sixteen of you attended a total of 18 conferences for academic and professional benefit. Your scholarship has been recognized both within the university and by outside organizations. Now we move to presenting our culminating awards for the 2014-2015 academic year, which will be hosted by Distinguished Professor Jacquelynne Eccles, Director of the Ph.D. in Education program. ​The Keith Curry Scholarship was established by Dr. Curry to honor a Ph.D. student who has demonstrated significant growth in academic achievement and unusual perseverance – qualities that Dr. Curry believes characterized his journey toward his doctorate. This year’s recipient of the Keith Curry scholarship award, Marcela Martinez Reyes, exemplifies these characteristics. She is an outstanding scholar with one published paper, 3 papers under review, and 3 more in progress. She has given 7 conference presentations. She has received several awards and honors across her years here at UCI, including a Eugene Cota-Robles Fellowship and two honorable mention fellowship awards – one for the UCI Faculty Mentor Program award and one for the Ford Foundation Fellowship award. She has served as a GSR for Thad Domina and Greg Duncan and a teaching assistant in Education 50 (Origins, Purposes, and Central Issues in K-12 Education), as well as giving several guest lectures in both Education 50 and Education 108 (Adolescent Development). Finally, she has provided outstanding service to the School of Education, serving on the PhD admissions committee, as a mentor in the Competitive Edge Summer Research Program, as a representative to the California Forum for Diversity in Graduate Education, and as a web designer for the Chicano/Latino Graduate Student Collective. Congratulations, Marcela. For the past two years, the Associated Doctoral Students in Education (ADSE) has honored a student for outstanding service to the School and to his fellow students. I would like to invite Rachel Stumpf, ADSE President, and Masha Jones, ADSE Vice President, to come forward to present this award. Doron volunteered a considerable amount of time working with other graduate students, faculty, and staff to put together a successful recruitment weekend. 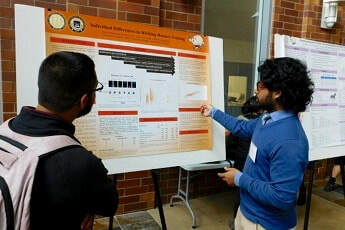 He collaborated with other graduate students to redesign several of the recruitment events, such as the interactive poster sessions for the specialization meetings. His hard work and dedication benefited the entire school as well as the new incoming cohort. Doron has also shown his commitment to diversity efforts through his strong support for the SoE DECADE group. This year, he volunteered to take the lead on the DECADE peer mentor training. He took the time to create training materials, conduct the training to 14 peer mentors, and has offered to help with year-end follow up and recommendations for next year’s peer mentor program. Doron is highly committed to SoE’s success and is highly deserving of this recognition. The Associated Doctoral Students in Education thank Doron for all of his hard work and present him the 2016 ADSE service award! In 2013, the School established the Michael E. Martinez Prize for Outstanding Research and Service. This annual award commemorates the scholarly and professional achievements of the late Michael E. Martinez, Professor of Education at the University of California, Irvine, from 1992 through 2012 - "Michael E. Martinez - A Lifetime of Service". As a scholar, Professor Martinez is remembered for his significant contributions to our understandings of cognitive processes and the malleability of intelligence, and how these understandings could be applied to student learning. He is also remembered for the kindness and collegiality that he embodied. In his honor, this award is given to a doctoral student who demonstrates superior scholarship, intellectual curiosity, and high levels of professionalism and collaboration with fellow students and/or faculty. I would like to invite Mrs. Stephanie Martinez to come forward to present the award. This year’s recipient conducts high quality research, is intellectually curious, and has been an exemplary student, collaborator, and school and university citizen. She has excelled in all her classes, worked on a variety of research projects, and collaborated with many; from undergraduate students to faculty. She utilizes both qualitative and quantitative methods to help understand the contextual contributions to parenting and children’s development. Her cross-cultural mixed method dissertation was awarded a dissertation grant from the Society for Research in Child Development as well as the UCI Chancellor’s Club Dissertation Fellowship. This student has also been a valuable resource to our School, volunteering her time as a decade mentor; ADSE Vice President, President, and faculty representative; student recruitment committee chair (more than once); and student member of the search committee for our incoming Dean. She has also contributed to the education of our students as teaching associate and mentor to undergraduate and more junior graduate students. In the spirit of this award, she “has demonstrated intellectual curiosity, high quality scholarship, and collegiality” throughout her time here. The School of Education is pleased to present this well-deserved award to Joyce Lin. We have a second award in this category. Elizabeth Miller is receiving Honorable Mention for the Michael E. Martinez Prize for Outstanding Research and Service. Elizabeth is completing her dissertation on the Use of Spanish in Head Start and Dual Language Learners’ Academic Achievement. She has received a Child Care Research Scholars Dissertation Grant from the U.S. Department of Health and Human Services, the administration for Children and Families. While at UCI, Elizabeth has been a Graduate Student Researcher for Professors Stephanie Reich, George Farkas, Deborah Vandell, and Margaret Burchinal. She also served as lab instructor for EDUC 265: Applied Regression Analysis for Education and Social Research with Distinguished Professor Greg Duncan. Additionally, she has served on a faculty search committee and was elected cohort representative for our ADSE. It is our pleasure to award Ms. Miller Honorable Mention for the 2016 Martinez Prize. ​Now we invite you to enjoy the culinary skills of Julie Hahm. The School of Education hosted an awards ceremony for the 43 undergraduates who earned their Certificate in After-School Education (CASE) by June 2016. The awards, which were held at the end of the undergraduates' final class in Education 191: Advanced Fieldwork in Afterschool Education, were presented by Dr. Jenel Lao, course instructor and Director of Online Learning. Providing UCI undergraduates with foundational knowledge about historical perspectives and policy initiatives in after-school education, as well as current research that identifies the predictors for positive participant outcomes in after-school programs. Developing in UCI undergraduates an understanding of child and adolescent development and the need to match after-school experiences with the interests, needs, and developmental level of program participants. Exposing UCI undergraduates to different after-school program models, and develop their practical knowledge about program evaluation so that they can critically assess program strengths and weaknesses. Providing UCI undergraduates with comprehensive fieldwork experiences where they develop their abilities to design and implement high quality after-school program activities for children and adolescents in the programs that they serve. Building UCI undergraduates’ awareness of how this certificate program provides a foundation for career options in after-school education, K-12 teaching, or other education-related careers, as well as graduate study opportunities. To earn a certificate, an undergraduate must complete a minimum of six courses totaling 24 quarter units and a minimum of 70 hours of field experience. Students select courses from the categories below, choose an elective course, and complete the CASE Capstrone course: "Advanced Fieldwork in After-School Education." 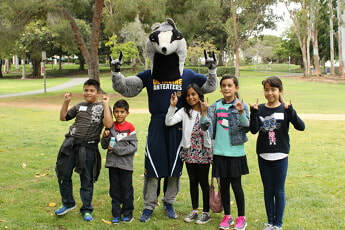 Fourth and fifth grade students from Roosevelt Elementary School in Santa Ana visited UC Irvine on May 27th as part of their engagement as citizen scientists in Project CRYSTAL. Prior to their visit, the Roosevelt students had been exploring ways to promote native plant species and control invasive non-native plant species at Crystal Cove State Park. Following the scientific method, the students (a) had received a classroom introduction to the problem (to weed or not to weed; to fence or not to fence), (b) had toured the park to assess the environment, (c) were introduced to scientific equipment such as leaf porometers and soil moisture meters, (d) learned how to measure transpiration rates, (e) used newly-acquired knowledge and accompanying scientific equipment to gather data at the park, (f) analyzed the data, and (g) presented recommendations based upon their findings. The UCI field trip was a culminating event providing an opportunity for the Roosevelt students to see UCI student and faculty scientists at work in the UCI Green House and School of Biology labs. 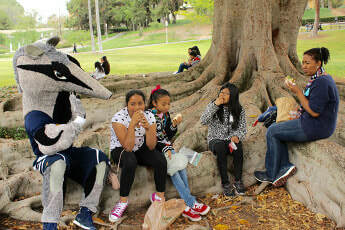 As an added bonus, the students picnicked in Aldrich Park under the Harry Potter Whomping Willow tree and toured Middle Earth housing and the UCI Student Center. Their Roosevelt Elementary visit was facilitated by Ph.D. in Education students David Liu, Christopher Stillwell with support from UCI undergraduate research assistants. ​Project CRYSTAL is a collaboration among the School of Education (Dr. Rossella Santagata and Dr. Hosun Kang), the Center for Environmental Biology in the School of Biological Sciences (Dr. Jennifer Long and Dr. Sarah Kimball), Crystal Cove Alliance, and Santa Ana Unified School District (SAUSD) to develop citizen scientists.